Every day, you make — or avoid — decisions. Every day your choices determine who you are. You are what you decide. Whether twenty- or thirty-somethings grappling with career choices, fifty year-olds in major life transition, septuagenarians struggling to make a major purchase, octogenarians facing late-in-life dilemmas, school district teams dealing with difficult trade-offs or CEOs making complex business decisions, the reader testimonials and Amazon reviews are clear: the Eight Keys are simple, accessible, immediately useful and effective at improving your decision-making. Want to make better decisions? Spend a few hours with the Eight Keys today! Life is a cascade of challenges. Sometimes the flow trickles and sometimes it roars. How well you navigate determines who you are and your quality of life. Do you embrace the flow or avoid it? Does a torrent motivate or immobilize you? Do you look to the future with hope or fear? Your answers to these questions probably correlate to your decision-making skill. From our first months as infants, we are hard-wired to want to choose. Why then do we often struggle with decision-making? Avoid it? Fear it? Why are we occasionally abysmal at it? The answer is simple. Most of us have never been taught formal decision-making processes. (Well, my mother always did tell me to make a list of the pros and the cons!) Without a set of decision tools and techniques to draw on, anyone can become overwhelmed by weighty decisions. Decision-making is not just about the fork in the stream, the moment of choice-making, the selection of the final option. Decision-making is a process that requires commitment, exploration, ideation, courage, self-reflection, evaluation, action and continuous learning. Further, decision-making involves more than critical thinking. Indeed, it is an inherently creative act. Commit resources commensurate with the weight of the decision. Know explicitly what you are trying to achieve. Conquer your fear to make a mistake, to fail or to take a risk. Know and question all your key assumptions. Be acutely aware of and root out cognitive biases and fallacies. 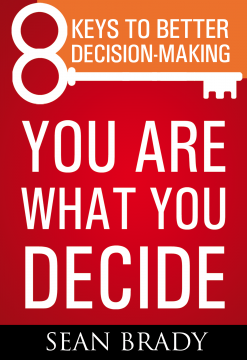 When making important choices, be deliberate: decide how you will decide. Act decisively, monitor closely and learn continuously. With practice, the Eight Keys will enable you better to navigate life’s cascade of challenges. The stakes are high. There is no avoiding life’s still waters or its raging rapids. Every day, you make — or avoid — decisions.